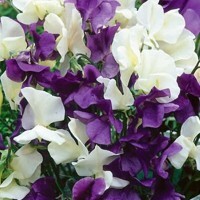 Grandiflora mix of Heathcliff & Cathy producing beautiful scents and exquisite cream & violet colours. Sow indoors Jan-Mar or Sep to Oct in 7cm pots or long root trianers. Sow singly cover with 1.5cm of compost. Keep moist cover with glass or place in propogator, Keep at 15 degrees. Remove cover once seedlings appear. Sow outdoors April to May. Sow by end 2019.